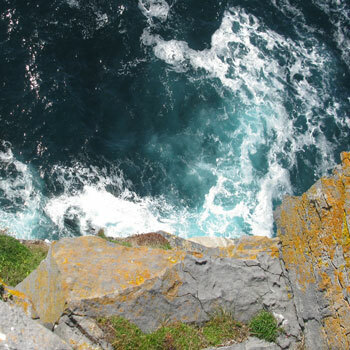 THE CLIFF IS SHEER and the sea is deep, and you’re at the very edge. Your black dress balloons out behind you, a flower bending in the wind.For a second there’s nothing in my picture-perfect world but the sky, the sea and you. Globes of warm blue above and cold blue below. And in the middle, you in your scarlet jacket, a bolt of red lightning linking the heavens to the waters. Look at me, you say, arms flung out in an accidental crucifix, dark hair streaming. What are you waiting for? Dive on in, the water’s lovely. You first, I say politely. It is sixty feet to the white-tipped waves. Perhaps not, you say. But you do a little dance on the edge, your feet kicking out into space. For God’s sake, I say. Don’t do that. Why not? you say. What’s the problem? Am I frightening you? Actually, yes, I say. You’re frightening me. Now will you come away? Reluctantly you step back. Then you toss a pebble over the edge. It disappears half way to the water, invisibly small. I feebly wrap my thin coat a little tighter against the sheet of wind. Salt spray stings my broken lips. Look! you say, leaping in the air. I can fly! And so you do, swept up in the onrushing air, for a couple of feet at least. Very good, I say. Now can we go somewhere and get out of the wind? You’re such a scaredy-cat, you say, sitting on the damp grass and ruined chalk, legs hanging over the edge. Don’t do that, I say. It’s not safe. The cliff might give way. You pretend not to hear me. Up here, you say, it’s like being all alone in the world. Just you and me. And the wind, I add. And the wind, you agree, tossing another pebble to join the first at the vanishing point. Do you think it’d be possible to jump off and live? And you lean forward over the abyss. My heart is alive in my chest. You’re going to find out if you keep doing that. I’m not going to fall off, you say. I’ve got a good grip. Famous last words, I say. It’s a long way down, you muse. It is, I say warily. And it’s a one-way trip. Well, I was only thinking about going one way anyway, you say. Oh for God’s sake, I say. What kind of talk is that? Really, you say, half-turning to me. What’s to stop me? There is a glint in your eye. Me, for a start, I say. I wouldn’t let you. How would you stop me? you ask. What do you mean, how would I stop you? I just would. You scramble to your feet. The chalk under your feet flakes, blows away in the wind. Come on, then. Come on over here and stop me. I look down. The grass below my feet is swaying and circling. I can’t, I say. The sea is retreating from my subtended gaze. Well then, you say. See you at the bottom. You spread your arms again. And you step off with one foot. Stop it, I try to say. My breath is growing clotted and thick in my chest; my sight has a narrowed to a cylindrical haze. Get back from there. You’ll have to come and get me, you say. Why are you doing this? I protest, even as I stumble gingerly across the tilting earth. I reach for you, fingertips extended, but you do not break your flamingo pose until I am well within reach. Then you exhale, leap at me and bowl us both over, your arms around my neck and your breath warm and moist on my face as we fall heavily to the sturdy ground and roll away from the edge. There you are! you crow. No more vertigo! Don’t you ever bloody do that again, I say. This is an old story – probably dating from the mid-1990s. I think I wrote it to prove to myself that I could write dialogue; you can judge for yourself if I succeeded. That’s about it for sleevenotes. Enjoyed this very much – liked the evocation of place and the imagery around the scarlet jacket is great! Though if I were going to indulge in unnecessary carping I don’t understand the “warm blue globes above” and if she’s leaping a couple of feet into the air from a standstill she must be some jumper. Telling the story in reported speech: I slap you heartily upon the back and place a drink in your hand! At once the language of memory and personal fantasy, the perfect backdrop to the ultra-vividness of the scene. Colours are brighter and there is girl/boy/sea/sky/bravery/vulnerability and beauty everywhere one looks. I love the parallel between the danger in the story and the danger of allowing oneself to be so taken over by such perfect fantasies. Simultaneously the physicality of the story denies the reader the safety clung to by the boy, his “broken lips” a telling sign he has come too close to turn back now despite his fear. The increasing rapidity of the I say/you say builds speed and momentum and the chaos the girl throws into this sensitive boy’s orderly world; “sitting on the damp grass and ruined chalk, legs hanging over the edge.” is irresistible. The reader is delighted that the boy does “give way” before the cliff and relieved that the embracing of the danger only temporarily destroys it for already she is throwing “another pebble”. I enjoyed the way the story poses the momentous decisions one makes at the start of any relationship: whether to “join the first at the vanishing point” and whether it is possible to keep your sense of self,”Do you think it’d be possible to jump off and live?” I guess it seems especially real in that the girl takes charge of these decisions! The dialogue works very well, I particularly like the lack of quotes around the spoken parts. And I’m terrified of heights – this piece was very good at digging out some not very dormant terrors! I hate it when people take dumb risks just for fun. I’d feel just like the guy too. Vertigo is not fun at all! Very well written peice. I thought for sure she was going to fall or toss him over the cliff.